In small bowl, mix curry powder, cinnamon, nutmeg, cloves and 1 teaspoon salt. Cut each chicken breast in half crosswise to make total of 8 equal portions. Coat chicken evenly with seasoning mixture. In 12-inch nonstick skillet, heat 3 tablespoons of the oil over medium-high heat. Add chicken; cook 3 to 4 minutes on each side or until lightly browned. Remove from heat. In 2-quart saucepan, heat remaining 1 tablespoon oil over medium-high heat. Add onion, red pepper and chile; cook 4 to 6 minutes, stirring frequently, until onion is tender. Reduce heat to medium. Stir in preserves; cook about 5 minutes or until heated. Stir in dash of salt; remove from heat. Cool slightly. Heat oven to 375°F. Line cookie sheet with cooking parchment paper. On work surface, unroll dough sheets. Cut each sheet into quarters. 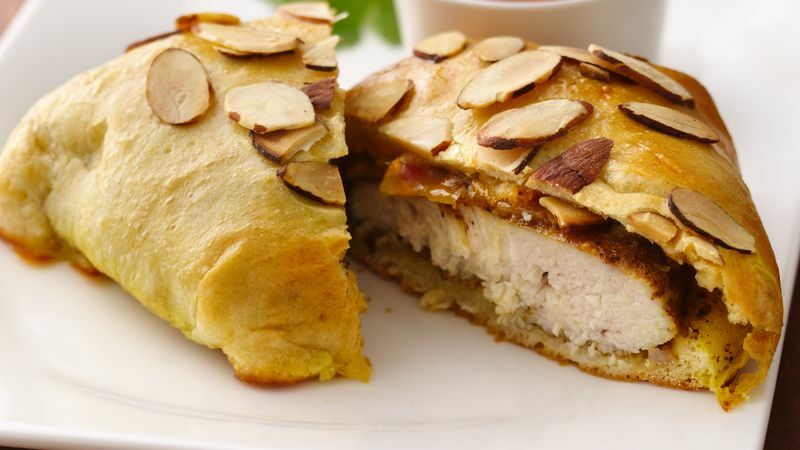 On center of each dough rectangle, place cheese piece; top with 1 teaspoon preserves mixture, 1 teaspoon almonds and chicken piece. In small bowl, beat egg and water until well blended; brush on edges of dough rectangle. Bring up dough over filling; press edges to seal. Place seam side down on cookie sheet. Brush tops with remaining egg mixture; sprinkle with any remaining almonds. Bake 12 to 18 minutes or until golden brown. Serve warm with remaining preserves mixture. *To toast almonds, cook in ungreased heavy skillet over medium heat 5 to 7 minutes, stirring frequently until almonds begin to brown, then stirring constantly until light brown. Remove from skillet to plate to cool.